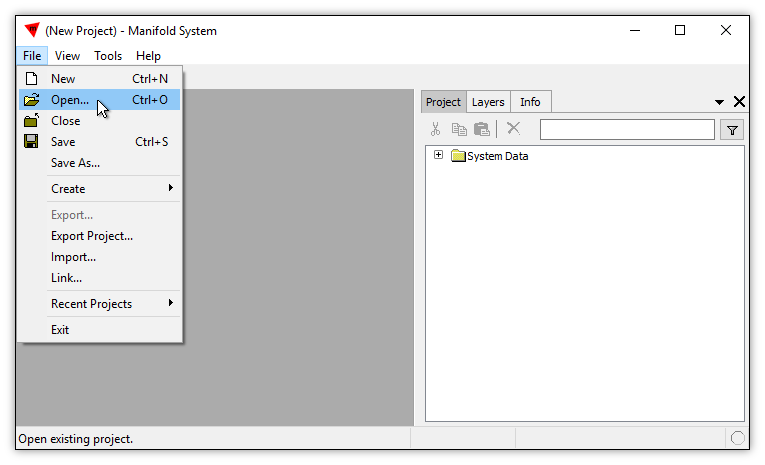 This topic shows how to convert data in ESRI's legacy personal geodatabase format into a Manifold .map project in a single step. ESRI's personal geodatabase format is the original ArcGIS "geodatabase" format. Data in a personal geodatabase is stored and managed in Microsoft Access .mdb files, and thus subject to all the limitations and inconveniences of .mdb format in a 64-bit world. Personal geodatabases are limited to 2 GB, with performance typically degrading between 250 MB and 500 MB. ESRI users seem to agree that personal geodatabases as a format are on their way out, being replaced by file geodatabases. 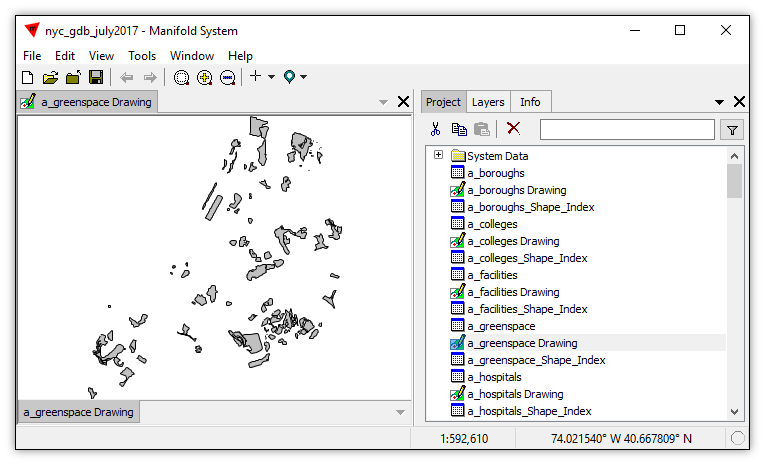 Manifold users will want to convert their personal geodatabases into either Manifold .map projects for immediate, high-speed use or into ultra-compact Manifold .mxb archive files for archival storage and exchange. Lucky for us, Manifold's Export capability can convert an entire ESRI personal geodatabase into a .map or .mxb project in a single step. We will illustrate export of a personal geodatabase containing information on New York city in the United States published by Baruch College. Non-profit organizations using the free Manifold Viewer for analytics can more easily access this data in .map or .mxb form, which the license for the data allows. 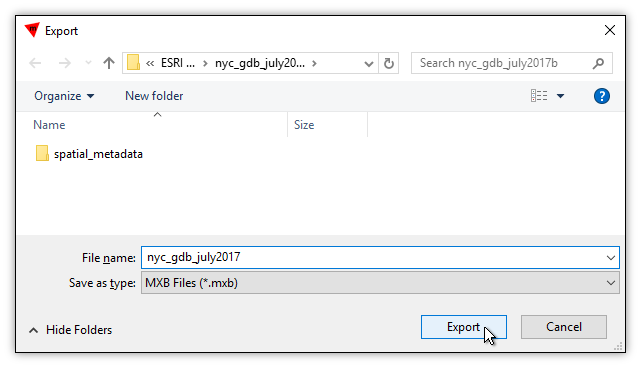 The "geodatabase" consists of a Microsoft Access .mdb file called nyc_gdb_july2017.mdb. Important: If we are running a 64-bit Windows operating system we must launch Manifold in 32-bit mode so we can link the .mdb Access database into Manifold without having to worry if our particular Windows installation has been retrofitted to talk to Microsoft .mdb. See the Launch in 32-bit Mode topic as well as the discussion in the MDB Files in 64-bit Windows essay. 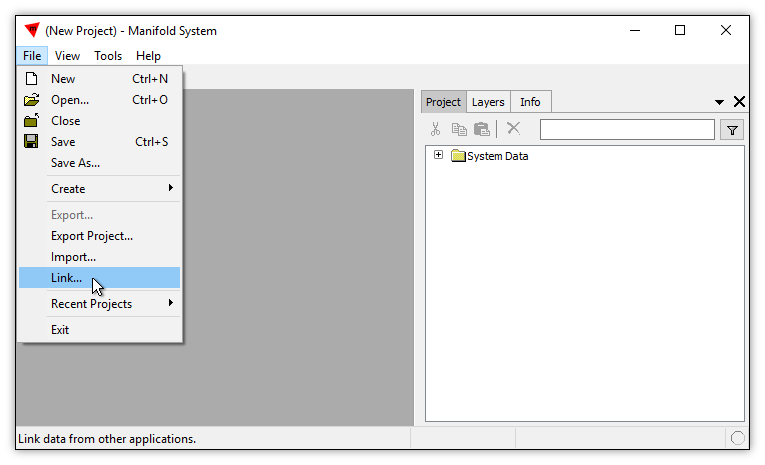 We launch Manifold in 32-bit mode and choose File - Link. 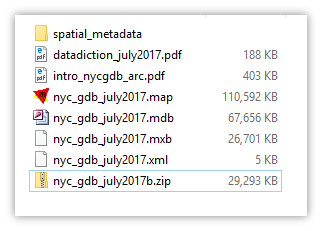 We navigate into the folder that holds the nyc_gdb_july2017.mdb file. We click on the nyc_gdb_july2017.mdb file and choose Link. There is no need to specify the file type since the Manifold dataport for .mdb automatically swings into action. A new data source called nyc_gdb_july2017 appears in the project. 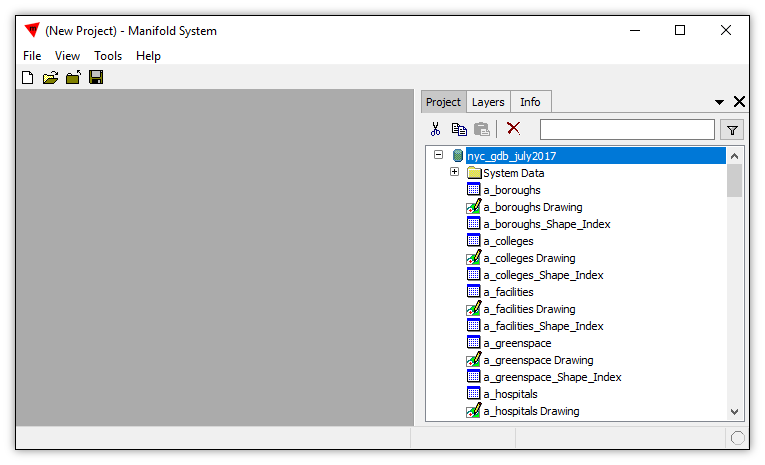 We click on the + box by the name of the data source to expand the data source, to see the many drawings and tables that are stored in the geodatabase. Next, we Right-click onto the nyc_gdb_july2017 data source. We can see a new .map project has been created by opening the newly-created .map file. 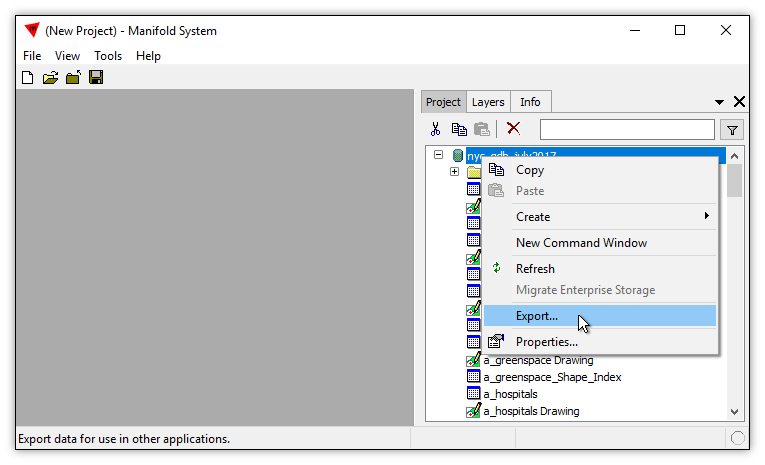 In a new, blank Manifold session, which could be 64-bit Manifold running in 64-bit Windows, we choose File - Open. The .map project opens instantly, and we see that the export process did, indeed, convert all of the nyc_gdb_july2017.mdb personal geodatabase content into a single, high-performance .map project. In the illustration below we have used Style to color the areas in the a_greenspace Drawing using the OBJECTID field. We have also added a Bing satellite layer below the drawing layer. If we had opened the Manifold .mxb archive, we would have reconstituted the above project as well. The only difference would be that the .mxb would not open instantaneously as does Manifold's everyday working format, .map. The personal geodatabase in native ESRI personal geodatabase format, ready for use within ArcGIS, occupies about 67 MB and requires one file. It also requires use of 32-bit software or use of Microsoft's special retrofitting of 64-bit Windows using software that clashes with Microsoft Office. Microsoft MDB format is also famously fragile. 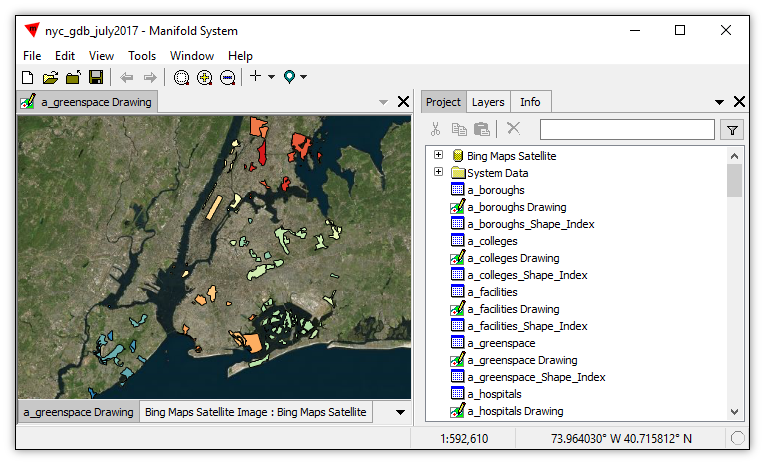 Converted to a .map the spatial data occupies about 110 MB, roughly 40% larger than the original ESRI file geodatabase, but ready for use in 32-bit or 64-bit software. The .map file, of course, is also fully parallel Radian technology delivering speed many times faster than possible with Microsoft .mdb format, while being famously bulletproof. 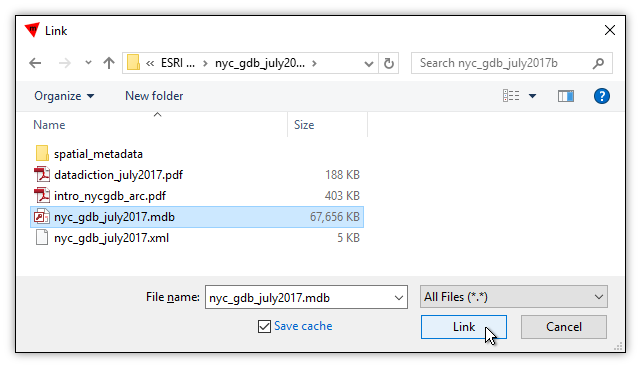 In the case of the nyc_gdb_july2017.mdb personal geodatabase, when the .mdb is zipped the zip file requires 29 MB. The equivalent Manifold .mxb file is about 27 MB, slightly smaller, a typical result.